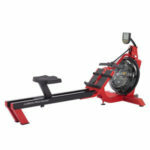 The S6 Laguna is one of the more expensive fluid rowers from First Degree Fitness. That’s because it offers quite a bit more than the Daytona Challenge AR or the FDF Newport models. To begin with, it’s actually a commercial grade machine, with a solid dual rail system, and a 16 level water tank. 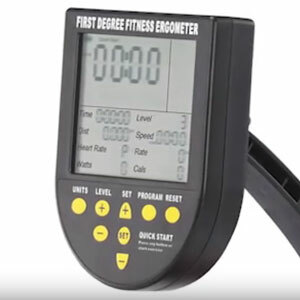 Its exercise meter is also different, featuring 16 levels of intensity as well, to coincide with the resistance levels of the water tank, and of course, to provide an effective reading of your calories burned and other workout statistics. 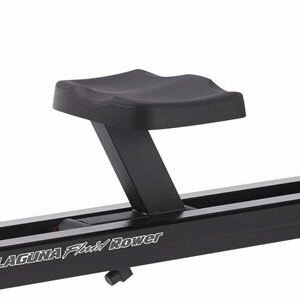 As we’ve mentioned above, the water tank of the FDF S6 Laguna fluid rower features a different construction than the tanks on other FDF models, such as the Daytona Challenge or Viking 2 AR. First of all, it’s a lighter tank, with only 2 gal (7.6 liter) capacity. It’s made of heavy-duty, clear polycarbonate material. 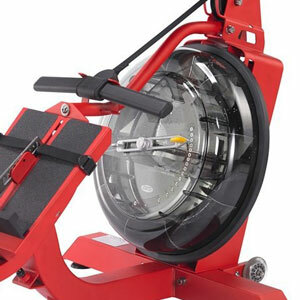 The flywheel / impeller is heavier though, made of stainless steel material, connected to a system of bungee cords and pulleys, which also add resistance to the overall rowing motion. The tank offers adjustable resistance, feature that other rowing machine such as the WaterRower GX or Stamina 1450 don’t have. It’s divided into two chambers, a “storage” chamber and an “active” chamber. The more water in the “active” chamber, the higher resistance the machine will provide. The dial on top of the tank controls the water level in the active chamber, offering up to 16 different levels. The first 1-3 levels offer light resistance, great for recovery training, muscle toning, or in general, a light cardio workout. Conversely, the top resistance levels can offer the intensity required by professional athletes. Evidently, since it’s a water rowing machine, the resistance is variable, regardless the water level in the active chamber. In other words, the resistance behind each stroke is also conditioned by how fast (or how hard) you pull. The rowing feel is similar to rowing a real boat. Also, the operation of the machine is quiet, and the sound generated by the spin of the impeller in the water tank has been described by most users as “soothing”. 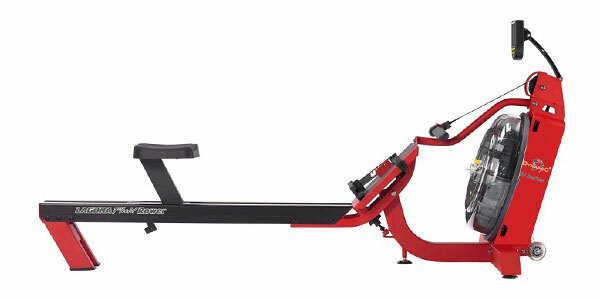 The frame construction of this First Degree Fitness rower integrates aluminum and steel parts. The part of the frame that sustains and protects the water tank, as well as the rear base stabilizers, are made of steel tubing. The gliding rails of the seat on the other hand, are made of anodized aluminum, for a smoother glide. The steel parts are coated with red paint, while the rails have a black finish. The paint finish on the frame is corrosion resistant, but nonetheless, this rower is made for indoor use only. Moisture can still cause damage to the console. This fitness machine takes quite a bit of space, especially lengthwise. It’s 83.5″ (212 cm) long, and 31.9″ (81 cm) wide. It doesn’t have a folding design, but it can be stored vertically, resting on its front metallic frame. The rails are long enough to supply a complete leg extension for users up to 6’5″ (195 cm). The machine is rather heavy, weighing approx. 122 lbs (55.3 kg). By adding water in the tank will add approx. 16 lbs (7 kg) of weight to it. It’s equipped with a set of silicone wheels though, which facilitate its relocation. Also, in case you’re wondering, the water can remain in the tank when the unit is stored vertically. You don’t need empty / refill the tank between uses. The front part of the frame integrates 3 adjustable stabilizers, with rubber caps. The rear “feet” are non-adjustable, but their bases feature heat-injected rubber pads. These being said, the machine offers excellent stability. The seat on this FDF rower features a metallic frame itself. It glides on two sets of wheels, placed on the inside parts of the rails. The wheels integrate stainless steel ball bearings for smooth gliding and for a long lifespan. The top of the seat features a contoured surface with a thin sheet of padding, to provide optimal comfort. It’s positioned at approx. 2′ (61 cm) above floor level. This being said, taking position on the seat is easier, which can be quite a plus with users with disabilities. Also, the seat assembly is designed to withstand up to 330 lbs (150 kg) of user weight. 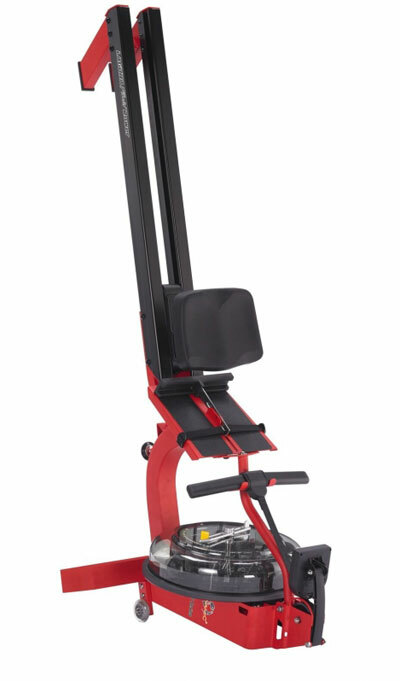 The machine’s pulling handle is a simple bar, slightly curved towards the user, to provide a more natural grip. It’s connected to a solid nylon strap, which transfers the traction to the flywheel. Last but not least, the footpads of the machine are adjustable and large enough to accommodate shoes of all sizes. They’re equipped with adjustable straps for extra foot stability in case it’s necessary. They feature heel guards, which also add stability to the positioning of the feet. The angle of the footpads can’t be adjusted though. The metallic plate on which they’re placed is fixed, part of the steel frame. It has an angle of approx. 45° though, providing optimal comfort. The computer unit supplied with the FDF S6 Laguna fluid rower is considerably more inclusive than a basic unit. First of all, it features a multi-panel LCD display, which means it can show all your workout statistics simultaneously, so you won’t have to scroll through them or use a SCAN function to roll between them. It displays all data required by a professional rower, including time, distance, speed, heart rate, watts, calories, revolutions per minute, strokes per minute, and 500/m units. Distance can be displayed in miles or km, while speed in MPH or km/h. Also, a HR receiver is included with the machine. Since this FDF rowing machine features a water tank with 16 levels of resistance, the computer unit also has 16 intensity levels. Therefore, in order to benefit from the correct reading of calories burned and other parameters, it’s required to correlate the level on the console the the selected resistance level on the tank. The console offers several on-board, interval-based workout programs and goal setting functions for time and distance. However, it also features online connectivity via its integrated USB port. Differently put, you can connect it to your PC or laptop via USB cable, in order to use various compatible online apps, such as the NetAthlon 2 XF for Rowers, in order to compete with others or train solo in a virtual 3D environment, record your progress, and access web-based logging and ranking systems. The meter is powered by 2 AA batteries, which are included. The assembly of this fitness machine is far from being difficult. The water tank and its pulley system come ready-assembled, and attached to the front part of the frame. All you need to do is connect it to the rest of the front steel frame, add the rails, the seat, the rear foot stabilizers and connect the console wires. The manual provides clear step-by-step assembly instructions. All the tools required for assembly are included. Also, a siphon pump is supplied for filling / emptying the tank. Maintenance requires treating the water in the tank periodically, with one of the supplied chlorine pills. It’s also recommended to wipe the rails with a dry piece of cloth before each use, to remove any sand, dust, fibers or any other small objects that might be on them which may cause damage to the rails or to the wheels of the seat. Console display doesn’t have backlight, and may be a bit difficult to read in poor lighting conditions. The First Degree Fitness S6 Laguna is a rowing machine designed by commercial standards, with a steel and aluminum frame, and a high user capacity. It’s a water resistance rower, featuring a tank with 16 distinctive levels of resistance. It’s equipped with a multi-function console, with online connectivity capabilities. It’s definitely a machine for users of all levels, from beginners to pro athletes. It delivers a consistent cardio workout which involves multiple muscle groups. It’s also great for stamina training, interval training and weight loss. Finally, it’s not exactly the most affordable rowing machine, but nonetheless, it’s a commercial grade rower; the quality in its construction and parts definitely stand up to the price.